I've been in Peru for six days now, and I have fallen in love with the country! We have seen and done so many things and met so many great people, and I know that it's not going to stop for the next week that we still have here. Today I thought I'd share one of my favorite topics in the world: FOOD! I think it would be an understatement to say that the food here is great. It's much more than that, but I can't think of a word to describe how delicioso the food is. It is so filling and filled with so much flavor that you can't get in the States. An interesting tidbit that I learned about Peru quickly is that dinner isn't at the traditional 5 or 6pm like it is in America. They actually have their biggest meal of the day at 1 or 2pm. During our traditional dinner time, Peruvians have snacks or juices or coffee. They do not have tea here at all. I found that interesting. Anyways, back to day two of our food journey! 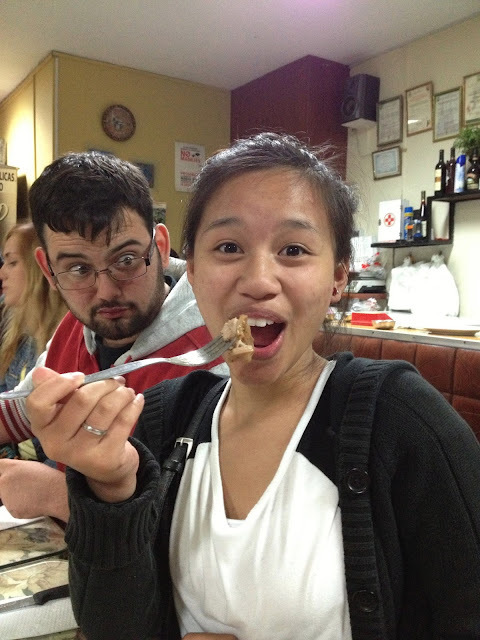 On Tuesday we had something that Peruvians call Chifa, or to us Americans, Chinese food. According to our team leader, Fernando, he said that the reason why Peruvians call Chinese food Chifa is because they don't like racism and the food has Peruvian twists on it so they call it Chifa instead. To them, referring to the food as Chinese can come off as racist and so they don't want to offend anyone. 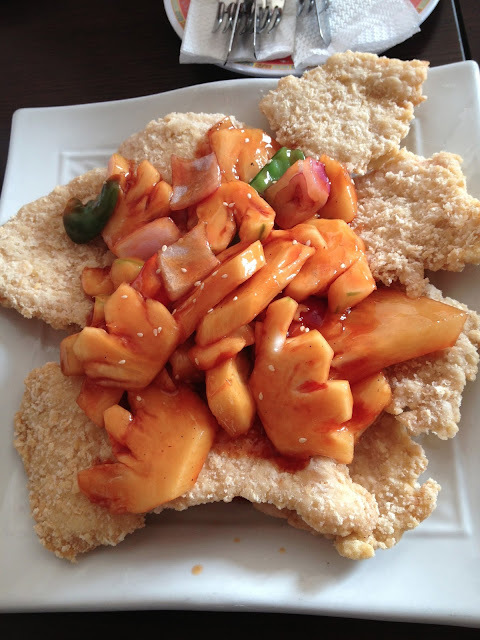 Chifa food is some of the best Chinese food I've ever had in my life. The Chifa food was a huge feast! It was also the day of the Columbia vs. Peru futból match, so that may also have explained all the food. I didn't take pictures of all the food, but I got quite a few. We probably had in all ten dishes which were all delicious and the best Chinese food I have ever had. We had everything from fried rice, fried wontons with some heavenly sweet and sour sauces (it's so good I roll my eyes thinking about it), so many different chicken dishes, chow mein with vegetables, steaming beef broccoli, and so much more. Lomo Saltado - just thinking about it is getting my mouth watering! The next day we ate at another restaurant where you could get traditional Peruvian food, like ceviche (made differently than Americans are used to, but better), Lomo Saltado, or Cuy (I'll explain that later). I got the Lomo Saltado a la Pobre, which is basically pieces of beef with fries, veggies, arroz (rice), egg on top, and plátano (means both plantain/banana) on the side. I've had it before in the States, but everything tastes so much better when you eat it in the country of origin. Now, back to the Cuy. I said I would explain what it was. Well my friend Christian (pictured below) had always wanted to try guinea pig, something that Peru is known for, and if you haven't been able to guess yet. That's what Cuy is. Yes, it's guinea pig guys. That's a picture of me trying a piece of his Cuy! It looks and tastes like pork with a lot of fat. Haha, it wasn't so bad. I only tried that piece on my fork, don't worry. I know that it sounds disgusting, but I try to be as adventurous of an eater as possible. As someone who loves food, I try to try as many unusual things as possible, especially if it's meat. Hahaha. Me trying cuy, or guinea pig! It's actually a very common meat here, just like chicken is common to most countries. The next day, we went to another restaurant that was much nicer than the one the day before and they served very similar food. I decided to get myself some seafood since it's rare that I get an opportunity to eat seafood in restaurants because of the price. Another random tidbit about Peru: all their foods are fresh. They don't freeze anything, so everything you eat was caught or killed that day. The food takes a while to come to you, but that's because the food is very fresh. However, the waits are always worth it. 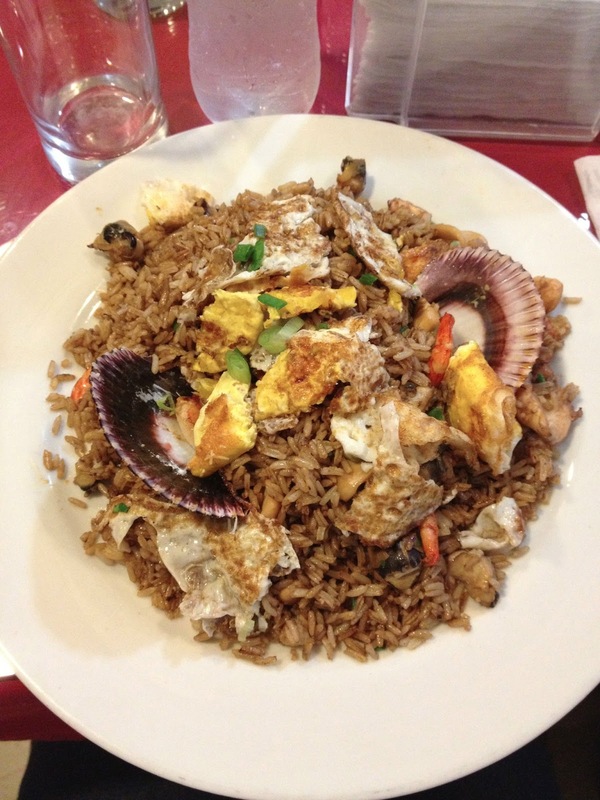 So at this restaurant, I decided to get Chaufa con Mariscos. Chaufa is fried rice with eggs, soy sauce, green onions, and other things. Mariscos, if you know Spanish, is seafood. There was calamari, shelled seafood, scallops, so many other types of seafood. It was SO MUCH food to eat! I was only able to eat a little less than 3/4 of the plate because it was so big with so much to eat. But wow, it was really filling. Yesterday, we ate at a restaurant that specialized in ceviche and lots of other seafood. There, I tried the Chita Frita, which is basically fried fish. It was a whole fried fish, which may startle some people, but with Filipinos, that's almost always how you eat fish, so that wasn't anything new. It also came with a bowl of so much different seafood in a yellow sauce, but unfortunately I wasn't able to get a picture of that. And as of that, that is my food journey so far! I haven't even been able to get into the breakfasts we've been eating, juices we've been drinking, and appetizers/sides from all those other meals! It's been all positive so far though. 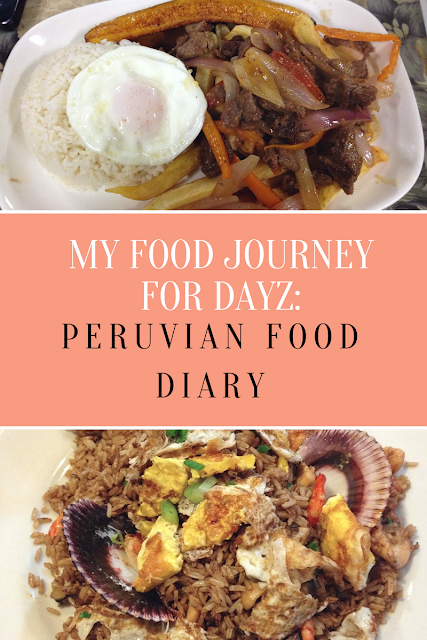 I'm excited for what we'll be eating for dinner tonight and the rest of our meals here in Peru! I'll post another food post at the end of the trip, but this is all for now. I'll try to update on other aspects of the trip, like ministries, futból (soccer), places we visit, and everything else next time I get a chance, but until then, as the Peruvians say, chau!